The CTSF is currently associated with the following campaigns. 104 times and raised a total of $23,468 ($865 in 2016)!! How is that even possible. If you are ever in North Andover please stop in - have a sandwich and thank them for their continued support. Dakota and I did!! And you just might see the Warrens!! 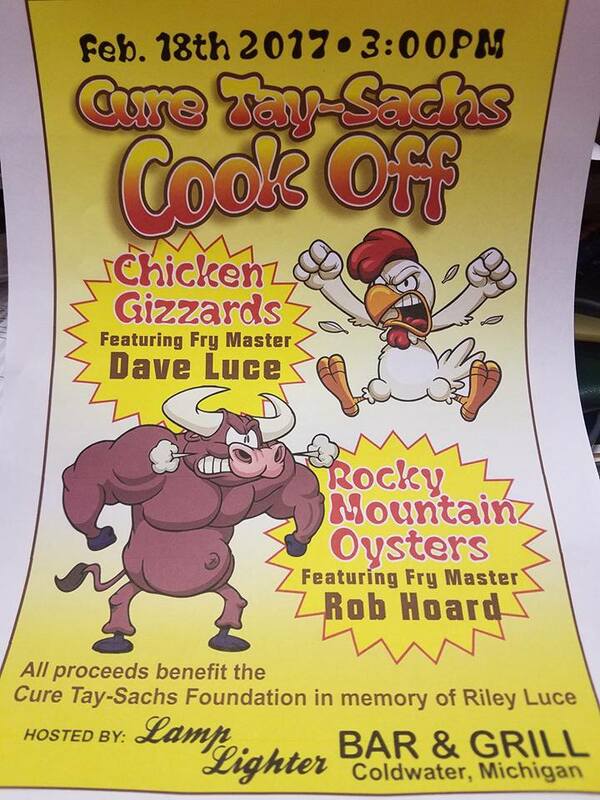 The Cure Tay-Sachs Cook Off featuring Fry Master Dave Luce's Chicken Gizzards and Fly Master Rob Hoard's Rocky Mountain Oysters will take place on Saturday, February 18, 2017 at Lamp Lighter Bar & Grill in Coldwater, MI. You got the stomach for it? All proceeds benefit the Cure Tay-Sachs Foundation in memory of the legendary Princess Riley Luce!! 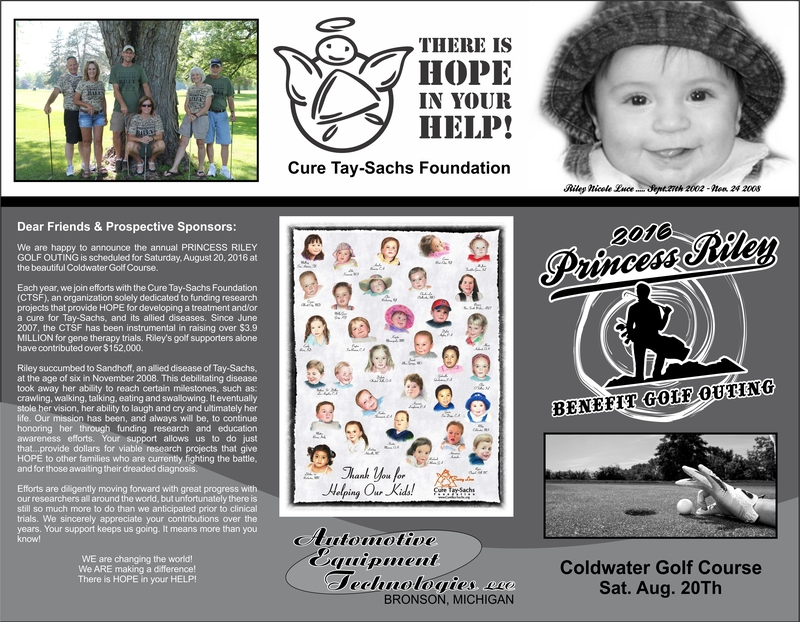 The 11th Annual Princess Riley Bear Golf Outing will take place on Saturday, August 12, 2017 at the Coldwater Country Club (same place as last year). Eleven years of supporting the amazing Riley Luce and her remarkable family. The Coldwater and surrounding community has supported the Luce family like every family wishes their community would. Plus this event is one fun time!!! More information to come!! The Cure Tay-Sachs Foundation will sponsored a number of fund raising events in 2016. The following is summary of the events that occurred and how they fared. The Cure Tay-Sachs Foundation is most grateful for the many volunteers that made the fundraising possible and the countless organizations that supported our efforts. When the CURE for Tay-Sachs disease becomes a reality, you will all know you had a significant role in making that happen. Thank you and God Bless! The Cure Tay-Sachs Foundation is a register charity with MissionFish. MissionFish is non-profit charity affiliated with eBay. The two organizations have teamed up to allow eBay sellers the chance to support their favorite charities. Every eBay seller has the opportunity to designate the Cure Tay-Sachs Foundation as a benefactor from their sale. The seller chooses our charity and then a percentage of the sale they wish to donate (must be at least $5). The downside is MissionFish does take up to 20% to cover their costs as a 501(c)(3) non-profit (the percentage gets lower the higher the selling price). If an eBay seller is classified as a "Direct Seller" for the foundation, then MissionFish takes no fee. The Cure Tay-Sachs Foundation has set up an eBay account so we can sell items on-line to benefit the foundation. If you are an eBay user and wish to help find a CURE — donate a portion of your sales to the Cure Tay-Sachs Foundation. If you have items you would like to sell to benefit the Cure Tay-Sachs Foundation — let us know and we can put them up for sale using the foundation's eBay account. GoodSearch is an internet search engine. The Cure Tay-Sachs Foundation has signed up as an eligible charity. If you select the Cure Tay-Sachs Foundation as your charity we get one cent for every search you do. Furthermore, if you buy items from an affiliated store, between 3-5% of that sale will be donated to the Cure Tay-Sachs Foundation. The service cost you nothing. Just select the Cure Tay-Sachs Foundation as your charity of choice and begin searching the internet and shopping just like you normally would. Make GoodSearch your search engine of choice and support the Cure Tay-Sachs Foundation. You would be helping us find a CURE. To begin earning us money, go to www.goodsearch.com. Did you know when you donate to United Way at work you could be having those donations earmarked for the Cure Tay-Sachs Foundation? When you sign up to make your donations, ask to make the Cure Tay-Sachs foundation the recipients of your donation. 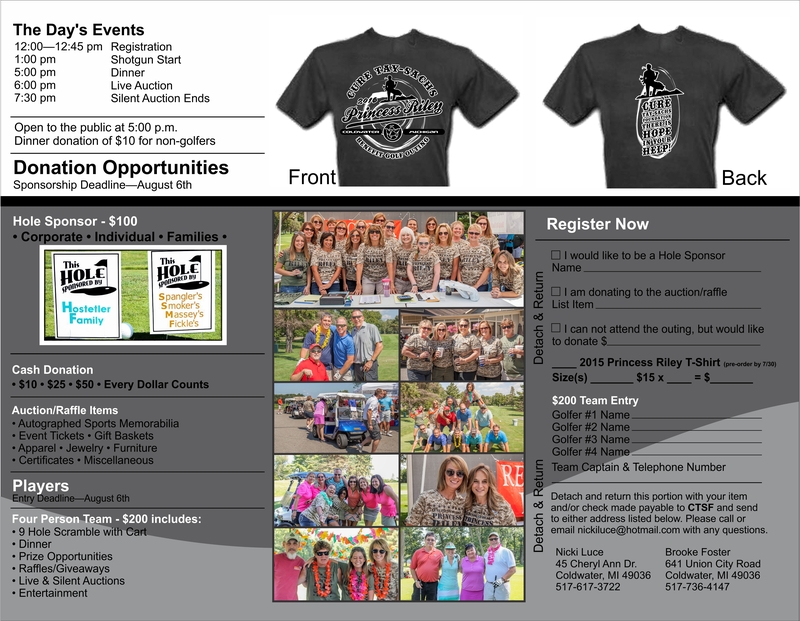 The requirements are that the charity is a 501(c)(3) approved organization — and we are! You may be asked for the Cure Tay-Sachs Foundation EIN or Tax ID#, the foundations address, and some contact information. I have provided all that detail below. Ask your Human Resource Department and see if you can't help us find a CURE for Tay-Sachs disease! We will issue you a receipt for your tax records. The Cure Tay-Foundation is a tax exempt, non-profit, charity approved by the Internal Revenue Service as a 501(c)(3). 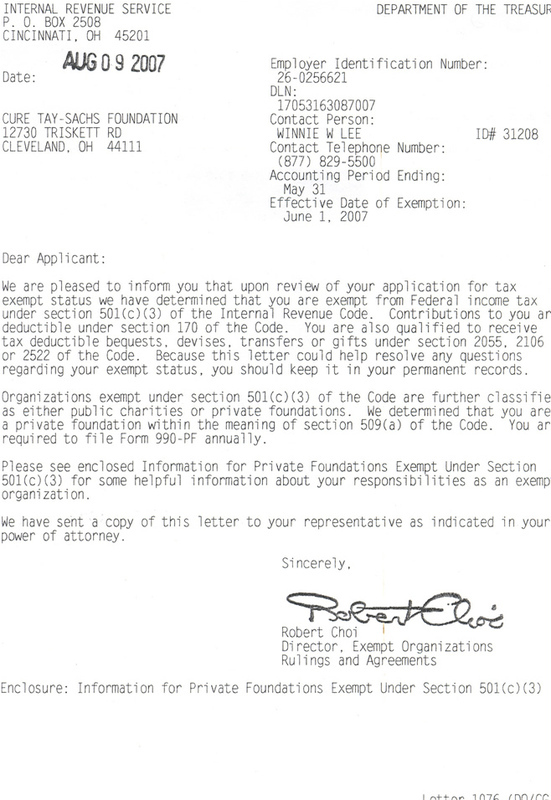 For a copy of the IRS determination letter, click here. To make a secure donation with a credit card or through PayPal, click the PayPal Donation button. You do NOT need a PayPal account to make a credit card donation. We will issue you a receipt for your tax records. The Cure Tay-Foundation is a tax exempt, non-profit, charity approved by the Internal Revenue Service as a 501(c)(3). For a copy of the IRS determination letter, click here. The Cure Tay-Sachs Foundation will sponsored a number of fund raising events in 2015. The following is summary of the events that occurred and how they fared. The Cure Tay-Sachs Foundation is most grateful for the many volunteers that made the fundraising possible and the countless organizations that supported our efforts. When the CURE for Tay-Sachs disease becomes a reality, you will all know you had a significant role in making that happen. Thank you and God Bless! The Cure Tay-Sachs Foundation will sponsored a number of fund raising events in 2014. The following is summary of the events that occurred and how they fared. The Cure Tay-Sachs Foundation is most grateful for the many volunteers that made the fundraising possible and the countless organizations that supported our efforts. When the CURE for Tay-Sachs disease becomes a reality, you will all know you had a significant role in making that happen. Thank you and God Bless! The Cure Tay-Sachs Foundation will sponsored a number of fund raising events in 2013. The following is summary of the events that occured and how they fared. The Cure Tay-Sachs Foundation is most grateful for the many volunteers that made the fundraising possible and the countless organizations that supported our efforts. When the CURE for Tay-Sachs disease becomes a reality, you will all know you had a significant role in making that happen. Thank you and God Bless! The Cure Tay-Sachs Foundation will sponsored a number of fund raising events in 2011. The following is summary of the events that occured and how they fared. The Cure Tay-Sachs Foundation is most grateful for the many volunteers that made the fundraising possible and the countless organizations that supported our efforts. When the CURE for Tay-Sachs disease becomes a reality, you will all know you had a significant role in making that happen. Thank you and God Bless! The Cure Tay-Sachs Foundation will sponsored a number of fund raising events in 2010. The following is summary of the events that occured and how they fared. The Cure Tay-Sachs Foundation is most grateful for the many volunteers that made the fundraising possible and the countless organizations that supported our efforts. When the CURE for Tay-Sachs disease becomes a reality, you will all know you had a significant role in making that happen. Thank you and God Bless! The Cure Tay-Sachs Foundation will sponsored a number of fund raising events in 2009. The following is summary of the events that occured and how they fared. The Cure Tay-Sachs Foundation is most grateful for the many volunteers that made the fundraising possible and the countless organizations that supported our efforts. When the CURE for Tay-Sachs disease becomes a reality, you will all know you had a significant role in making that happen. Thank you and God Bless! Ultimate Sports Auction - November 8th - $62,478 (less $12,385 in expenses)! !